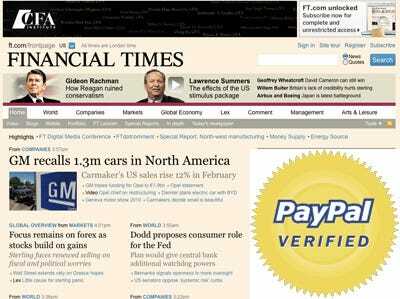 The Financial Times will begin testing PayPal to charge readers to reach its content on the Internet. PayPal, which is owned by Ebay, will give readers daily or weekly access to FT.com, in addition to its annual payment subscriptions. Users to pay £2, or a little under $3, for a day’s access to the site. CEO John Ridding made the announcement today at FT’s Digital Media and Broadcasting Conference, saying that PayPal will be implemented within the first half of the year. He added that publishers need to protect their control over pricing and reader data, even while platforms like Apple’s iPad or Amazon’s Kindle threaten to take hold of them. FT.com has more than 126,000 online subscribers and 750 direct corporate licenses, according to UK’s MarketingWeek. In 2009, content revenues increased by 15%, although revenues for the overall FT Group, which contains Interactive Data and FT Publishing, fell by 12% in 2009.